In the build up to the Women’s Literature Festival in Bristol on the 16-17 March, BookElf will be reviewing the word of the writers on the Womens Writing Today panal. The event will look at the issues facing women writers today, and their inspirations for their work. Bidisha is a writer and critic whose writing covers a range of issues, from gender and sexuality to international affairs. Often outspoken and unfliching in her opinions, espescially regarding the treatment of women and children, Bidisha’s first book, Seahorses, was written as a teenager and she has since presented Woman’s Hour on BBC Radio 4 and is a regular guest on Newsnight. She is chairing the Women’s Literature Festival. I don’t agree with everything Bidisha has ever written, but I enjoy her writing, it is sparse and to the point and doesn’t pull any punches, and she massively bigged up ForBooksSake last year, so is obviously in my good books. 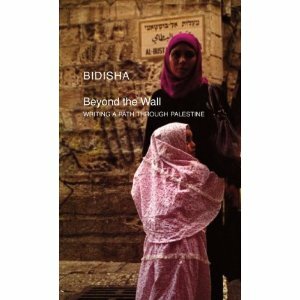 This Christmas I recieved her latest work, Beyond the Wall: Writing a Path Through Palestine. This short collection of happenings follows Bidisha and a group of other writers as they try to navigate the West Bank to various locations during the 2011 Palfest cultural festival. Bidisha, as a reporter, is completely unflinching in her descriptions of how utterly claustrophobic living in an occupied territory can be, in concrete blocks surrounded by soldiers with tanks at the end of your street and nets thrown over the yards surrounding your home where settlers can throw their rubbish, including their excrement. Some of the most heart rendering stories are those of the children living in the ghettos who are routinely harassed and antagonized by soldiers until they fight back and throw stones, giving Israeli forces justification for further fighting. What stands out most from this book is how frustrating a life living in such an area must be, being constantly searched, interrogated, having to stand for hours at checkpoints to get anywhere, how bored you must get. And no culture, or very little, other than the minimum that is allowed to you-books have to be smuggled into the country, Palestinian writers receive so very little support and cannot promote their work to a more Western audience. I know so very little about the situation in the West Bank. I have very good friends who campaign for both sides, which causes me horror when I hear about the bombings and the desolation in the news. Reading books like this, which give small bitter tastes of the lives of the people who live in the area and those who campaign for better lives for the children of Palestine (parts of the book are a little ‘won’t somebody think of the children’, but to be honest in situations like those described they kind of have to be) makes me ashamed of my ignorance and the need to actually occasionally read the papers and the blogs rather than live forever in my nice warm cave of ignorance.